Over the course of 20 months, the University of Washington full-time MBA students at the Foster School of Business take both core and elective coursework to complete their degree. This includes five core courses, one leadership development course, and 11 electives. Students must also take two international perspective activities and three practical experience activities, both of which may or may not be directly involved with current businesses. In the first year, University of Washington full-time MBA students take 38 credits in core courses such as Financial Reporting and Analysis, Marketing Strategy, and Statistics for Business Decisions. These courses take place over the first fall, spring, and summer quarters. Second year students take two core classes and a variety of electives. Eleven elective courses are required for the completion of the program, and they may cover topics in Business Economics, Entrepreneurship, and Operations Management. In addition, students may participate in experiential learning by joining a community board of directors, taking part in an international consulting project, or completing a fellowship. Students may also join MBA Core Case Competitions or a Business Plan Competition to test their skills against other top competitors. Lastly, students may take on a full-time, paid internship during the summer between the first and second years of classes. 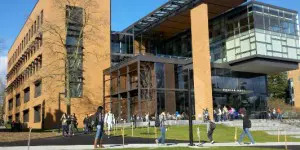 The University of Washington Foster School of Business full-time MBA class features 125 students. On average, students are 29-years old and have over six years of work experience. About 42 percent of the class is made up of female students, and 27 percent are of international origin. The average GMAT for this class is 696, and the average undergraduate GPA is 3.31. An estimated 99 percent of MBA grads earned employment within three months of graduation. The estimated average starting salary of recent grads is $118,355, with 76 percent of grads earning an average signing bonus of $38,695. University of Washington full-time MBA costs–including both tuition and fees–are $66,654 for Washington residents and $96,666 for non-residents. Full-time MBA students may qualify for up to $20,500 via the Stafford/Ford loan program. Eligible students must have U.S. citizenship, no prior defaults on federal student loans, and (if appropriate) draft registration. Furthermore, students may receive private loans, and the Foster School of Business can help interested students compare private lenders. Over one-third of MBA students receive scholarships, and both merit-based and need-based scholarships are available. First year merit-based scholarships are based on a student’s application (including GMAT score, GPA, and interview), whereas second year merit-based scholarships are based on a student’s current GPA and involvement in the Foster School of Business community. In addition, need-based scholarships are determined by FAFSA, and students should complete an online application to demonstrate financial need. Additional scholarships are available for women and minorities, international students, and U.S. veterans. Veterans may apply for the Tillman Military Scholars program, Military MBA Scholarships, and a GMAT fee reimbursement. While first-year full-time MBA students are discouraged from holding outside work, some second-year students may hold on-campus positions in MBA admissions or as teaching assistants. Foster full-time MBA applicants are required to hold a U.S. bachelor’s degree (or its equivalent). GMAT scores are required for all applicants. If students have taken the GMAT multiple times, the Foster adcom will accept the highest score; however, GMAT scores are only valid for five years and the test must be taken by the admissions deadline. In addition, students must prove quantitative analysis proficiency via college transcripts in quantitative courses, and/or current employment responsibilities. If necessary, students should submit evidence of English language proficiency via TOEFL, IELTS, or Pearson Test of English (Academic) scores. The completed application includes an online application, two required essays (plus one optional essay), a résumé, two letters of recommendation, all prior transcripts, an official GMAT score report, and an $85 application fee. Work experience is preferred, but not necessary to apply for the full-time MBA. Once a student’s application is received, the candidate may be invited to complete an admissions interview via video or in-person. Were B-School Researchers Wrong About Seattle’s Minimum Wage Laws? School v. School: Berkeley Haas or UW Foster?